The third year of NCI's Community Oncology Research Program (NCORP) was a charm as the community sites and research bases ramped up activities across the board, NCORP Director Worta McCaskill-Stevens, MD, told the network's annual meeting August 28th in Bethesda, Maryland. NCORP Director Worta McCaskill-Stevens, MD presents the 2017 Harry Hynes Award to Patrick J. Flynn, MD, of the Metro-Minnesota NCORP. NCI-supported NCORP sites bring cancer prevention, symptom science, and screening clinical trials, and cancer care delivery research to people in their local communities. As of August, 52 active trials are open, integrating all age levels from pediatrics to the elderly. NCORP comprises 46 grantees: seven Research Bases, 12 Minority/Underserved Community Sites, and 34 Community Sites. Since 2014 when the program was launched, 600 investigators have been added to the NCORP ranks, bringing the total to 4,025. The number of component and subcomponent sites reached 938. NCORP aims for an even mix between prevention and treatment trial accruals. For example, the network contributed to NCI precision medicine trials, including a 44% enrollment contribution to the NCI MATCH trial (Molecular Analysis for Therapy Choice). On the prevention side, the Tomosynthesis Mammographic Imaging Screening Trial (TMIST ), which was activated in July, will soon start enrolling the first of 165,000 women to compare tomosynthesis (3D mammography) with conventional (2-D) mammography to see if it reduces the chances that women might develop life-threatening breast cancers. In the core focus of cancer care disparities, the NCORP is collaborating with the NCI Center for Cancer Genomics on the Early Onset Malignancy Initiative to investigate the increased risk of early age onset of six cancers in certain racial and ethnic minority populations. Another highlight of the third year was symptom science and planning for novel trials informed by translational science as part of the national Cancer Moonshot Implementation effort. This included assessing methods for analyzing and interpreting Common Terminology Criteria for Adverse Events (CTCAE) data and the patient-reported outcomes version of CTCAE data. Cancer care delivery research is moving forward with four protocols approved, six protocols in review, and one concept pending a protocol, according to Ann Geiger, PhD, deputy associate director of the Healthcare Delivery Research Program, NCI Division of Cancer Control and Population Sciences. But there are challenges, such as unique trial characteristics and a shifting health insurance landscape. Four NCORP investigators were honored as the top accruers of participants to NCORP trials in the first 3 years: James Wade, Heartland NCORP, Jijun Liu, Heartland NCORP, and Mark O'Rourke, NCORP of the Carolinas, for treatment and cancer control trials combined; Carla Golden, Bay Area Tumor Institute, for treatment trials; and Jijun Liu, Heartland NCORP, for cancer control trials. Accrual recognition awards also were given to 358 physicians. 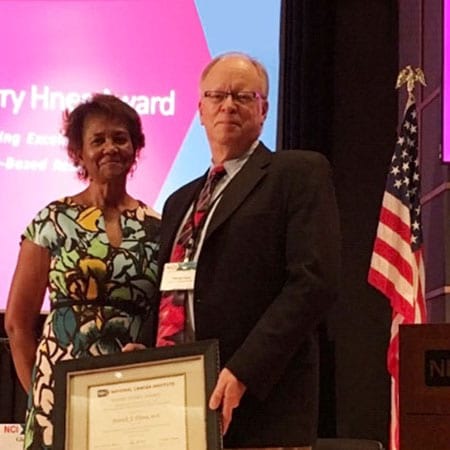 Additional NCORP teams and investigators were recognized for their successful levels of participation in the many volunteer efforts involving NCI boards, steering committees, task forces, working groups, coordinating committees, and advisory panels. Outstanding NCORP Administrator Awards were given to Connie Szczepanek, RN, BSN, Cancer Research Consortium of West Michigan, and Beth LaVasseur, MS, BSN, RN, Michigan Cancer Research Consortium NCORP. NCORP researchers and staff described the impact of the program in their communities in their own words, creating a real-time word cloud. The 2017 recipient of the Harry Hynes Award, Patrick J. Flynn, MD, of the Metro-Minnesota NCORP, embodies the attributes of the leadership and commitment demonstrated by Dr. Hynes, Dr. McCaskill-Stevens said. Dr. Flynn, an NCI community researcher since 1985, was described as a visionary investigator educated in the Midwest who built a practice with more than 140 researchers and 50 research staff. He began the discussion about insurance coverage many years ago, and successfully engaged insurers in his area to support clinical trials. Throughout the meeting, attendees used a phone application to engage with presenters and each other. One of the most used polls was the word-cloud, in which participants submitted their favorite three words to describe the impact NCORP is having in their communities. As each person weighed in, the word-cloud on the big screen in the plenary adjusted in real time. Words named the most grew visibly larger. As the meeting closed, the largest word at the center was "hope;" it was followed by "access" and "community."